Is there a Julius in the house? lily wrote: Is there a Julius in the house? There's an awful lot of Brutes about. DAVE Mahon has been asked to return to Ireland within days to be charged with the murder of his stepson Dean Fitzpatrick, Amy’s older brother. Currently in Spain with partner Audrey, the Gardai contacted Dave earlier this week to demand that he returns to Dublin. This follows the Olive Press’ exclusive new sensational evidence regarding the night of Amy’s disappearance and where she may be buried. Dean died aged 23 in May last year after he sustained a stab wound during an altercation with Dave in his Dublin flat, allegedly after confronting him over the disappearance of his sister Amy on New Year’s Day 2008. Dave was told the Director of Public Prosecutions had instructed he is to be charged, following months of consideration. But as yet he does not know exactly what the charge is. “I gave gardai my word when we went to Spain that I would come back if requested and that is what I am going to do,” Mr Mahon told The Star. Meanwhile the search for Amy continues. Thanks, Max. So we should hear more soon. Thanks Max, we've been waiting for that - not unexpected. Let's hope the truth about Amy comes out now. "This follows the Olive Press’ exclusive new sensational evidence regarding the night of Amy’s disappearance and where she may be buried." Who sent that one in? I haven't seen that. I hope it isn't true. But that might be a vain hope. Did her brother know something that he didn't tell anyone? For fear or something. Yes, that one's earlier in the thread, Sabot. I know we shouldn't be speculating, but frankly, when you've got a missing girl, a knifed, dead brother and an alcoholic mother, and the one factor in common is the thuggish stepfather, it's extremely hard to resist the temptation to dot-join. I hope all those forkers who held Aud'n'Dave up as the perfect example of what Families are supposed to do when someone goes missing are going to apologise? Irish laws about not prejudicing trials are probably similar to England and Wales? bb1 wrote: Yes, that one's earlier in the thread, Sabot. I know what I think, Bonny. And at the very least she ran away because she was scared witless. Have any of that other lot had anything to say lately? Sheesh, what a pair they are. Knifing your step son to death even if it was an accident. And his mother loves the barstard thug. Does anyone actually give a flying f*ck about him or Audrey? I cannot imagine how Dean and Amy's REAL father is feeling right now. I am still remembering that sickening love fest for Aud n Dave when it was obvious even then that something wasn't right about those two. FFS, a 13 year old sleeping in a field and not going to school? Camping with other families who felt sorry for her? And they had the audacity to hold up these two as an example to The McCanns. And their Aud didn't develop Liver Disease and become an Alcoholic in the space of a couple of years. I've been working on it for most of my quite long life, and I still haven't managed it. So she was likely drunk most of the time around those children. Wow. An interesting comment in there too. The whole thing is utterly shocking. I feel like spitting tin tacks but it wouldn't help. But I bet her mother wishes she had never gone back to Ireland. And I suppose him being found guilty of stabbing Dean in Ireland is marginally better than being convicted of killing Amy in Spain. THE stepfather of missing Amy Fitzpatrick touched down at Dublin Airport this afternoon to face charges in relation to the fatal stabbing of her brother Dean. Dave Mahon, who lives in Spain with Amy's mum Audrey, had been asked by Gardai to return to Ireland as the Director of Public Prosecutions has decided to bring charges against him. Mr Mahon told independent.ie he is "willing to face" whatever charges may be served against him. Dean Fitzpatrick (23) was fatally stabbed during a scuffle in an apartment at Burnell Square apartments, at Northern Cross, on the Malahide Road on May 25 last year. The father-of-one was rushed to Beaumont Hospital but pronounced dead soon after. He was stabbed in the abdomen. Mr Mahon has admitted to the killing but said that it was accidental. He said Dean ran at him while he was holding a knife that he had moments earlier taken from his stepson. Gardai arrested Mr Mahon but later released him without charge while a file was prepared for the DPP. 'Teary-eyed'? Was he holding an onion, because he looks like the same old cocky little sh*t to me. Notice Auds is missing. Teary eyed because the jig is up more like. DAVE MAHON has vowed to fight the murder charge that he is expected to receive tomorrow morning. He has returned to Ireland after being asked by the Gardai to face the charge over his stepson Dean Fitzpatrick’s death in May last year. Dean, a father himself, died from a stab wound sustained during an altercation with Mahon in his Dublin flat, allegedly after confronting him over the disappearance of his sister Amy on New Year’s Day 2008. Mahon told ‘The Irish Star’ that he had hoped to be charged with manslaughter and has previously claimed he only killed Dean in ‘self-defence’. “I’m not guilty of murder, not murder, Jesus no,” he said. Upon handing himself in, Mahon will be taken into custody and most likely held at Cloverhill remand prison in Dublin. Audrey, who will die if she does not receive a liver transplant, has remained in Spain due to the couple’s alleged poor finances. THE stepfather of missing teenager Amy Fitzpatrick has been charged with murdering her brother Dean. Dave Mahon (43) met gardai by arrangement this morning, was arrested and charged over the killing of Dean Fitzpatrick (23), who was fatally stabbed last year. He appeared in Dublin District Court and was remanded in custody after Judge Cormac Dunne was told he made no reply to the charge. Mr Mahon, with an address at The Crescent, Ongar Village, Clonsilla is charged with murdering Dean Fitzpatrick at Burnell Square Apartments, Northern Cross on the Malahide Road on May 26, 2013. Dean was fatally stabbed in an apartment in the complex on the night. Mr Mahon, who lives in Spain with Amy's mother Audrey, had been previously questioned by gardai and released without charge but returned to Ireland last Saturday after being notified that the DPP intended to prosecute him. 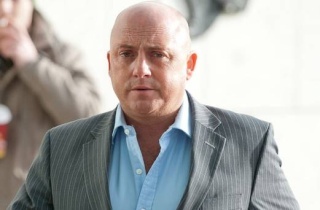 Detective Garda Brendan Mears told the court he met the accused at Coolock Garda Station by appointment at 9.26am. He was charged at 9.40am by Sgt Michael Gormley and made no reply after caution. Defence Solicitor Michael Staines made no application for bail on Mr Mahon's behalf, as this can only be granted in the High Court on a murder charge. Mr Staines told the court he wanted to say "for the record" that the accused had met the gardai by appointment for interview earlier in the investigation and kept in contact constantly during it. He had come back when requested. Judge Dunne granted legal aid after Mr Staines said his client was on disability allowance. There was no objection by gardai. Judge Dunne remanded the defendant in custody, to appear in Cloverhill District Court on April 2. The accused, wearing, a grey pinstripe suit, white open-necked shirt and carrying a walking cane raised his hand in greeting to the judge before and after the brief proceedings. He also waved to Audrey Fitzpatrick, who had sat in the public gallery of Courtroom No 2 in the Criminal Courts of Justice throughout this morning's proceedings. Dean Fitzpatrick, a father-of-one, was rushed to Beaumont Hospital following the stabbing but pronounced dead soon after. Deputy State Pathologist Dr Michael Curtis performed the autopsy and concluded that the cause of death was a stab wound to the abdomen. The Fitzpatrick family is well known, having run a campaign for five years in an effort to progress the search for Amy. Amy and Dean went to live in Spain in 2004 and were living there with their mother and her partner, Dave Mahon, when Amy went missing. She was last seen walking home from a friend’s house near Mijas on the Costa del Sol at about 10pm on New Year’s Day 2008. I see Aud is still hanging around him. She looks like sh*t.
She is in complete and utter denial by the sound of things. You can see she has liver problems. OMG she looks awful. Trying to care. I expect I will get there in a minute or twenty. DAVE Mahon has been let out of prison on €15,000 bail, after being formally charged with the murder of his stepson Dean Fitzpatrick. Mahon’s bail was granted by the High Court in his own bond of €10,000 and another €5,000 from his father Michael Mahon, who will act as an independent surety. 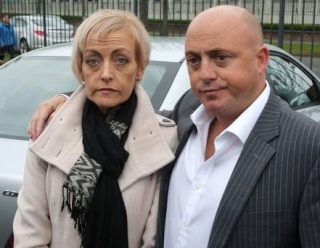 His partner Audrey – mother of missing Amy Fitzpatrick – watched on from the public gallery. Dean, a father of one, died from a stab wound in May last year, sustained during an altercation with Mahon in his Dublin flat. He had allegedly gone to confront Mahon over the disappearance of his sister Amy on New Year’s Day 2008. Mahon will not be returning to Spain however as his passport has been surrendered. He must reside at his address in Santry, Dublin, and sign on at his local garda station each day. Another chance to find out what happened to Amy passes by . Where did a benefit claimant get 10k from?….. Very unusual to be granted bail on a murder charge.